Even our means of entering the restaurant should have hinted that the evening was going to be less of a fine dining experience, and more of a lengthy piece of performance art. We follow a wooden pathway down a darkened corridor towards a half-scale projected image – a video, or perhaps a live feed? – of the Fat Duck Melbourne’s kitchen. Once we reach the image, the video finishes abruptly with a wooden door slamming, and we are plunged into darkness. No door opens. We can see no handle, no sign. We look around for clues. Seconds later, an invisible door slides open, and the maître d’ welcomes us with a smile. And with that, we are down the rabbit hole. We settle down at our table, not one of the window seats with a spectacular view of the Melbourne cityscape, but right by the huge fob watch that is counting down to the last day of service at the restaurant. 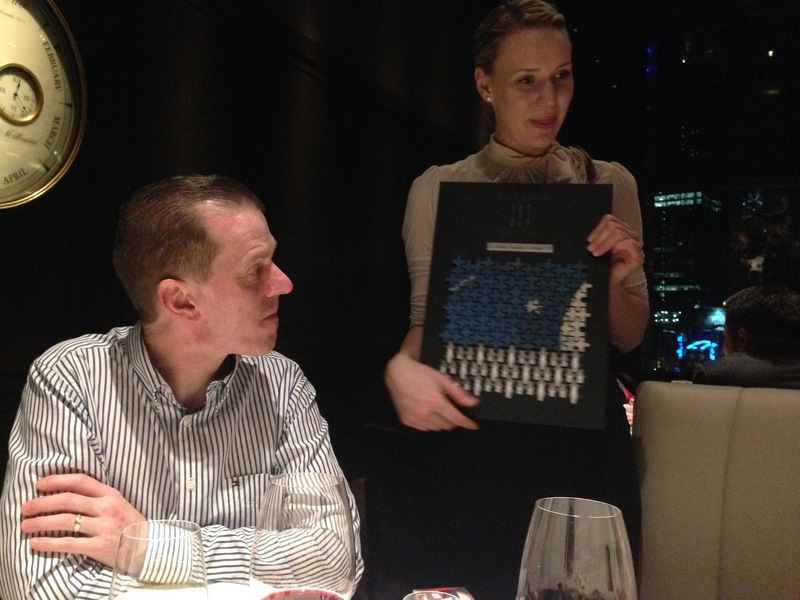 We are one of the forty-five lucky ones to experience the Fat Duck Melbourne tonight. The wine list book is a huge tome, dozens of heavy pages bound together like the pages of a fairytale book. A cheeky bottle of Bollinger seems the way to go, as we have all decided not to go with a wine-pairing option. We are left alone for a while to settle in before the show commences. And then it never stops. Just like Alice, we experience thirteen impossible things before breakfast, which is served just after midnight, about two-thirds of the way through our evening. 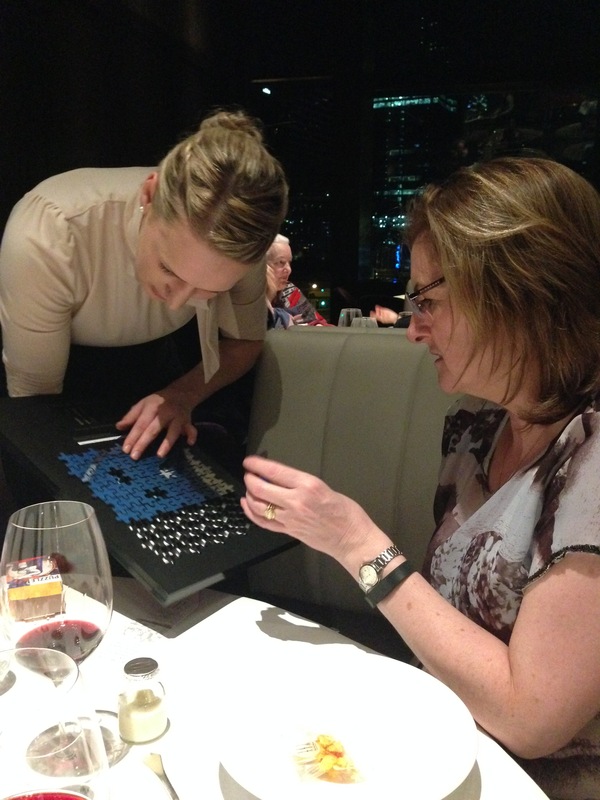 The impeccably knowledgeable and friendly serving staff guide us – sometimes gently, sometimes with quite detailed instructions – through a series of mind-boggling or puzzling or stupendous dishes. A single morsel of aerated beetroot that looks like a tiny savoury Ferrero Rocher. The fun of watching individual mouthfuls of nitro-poached apéritif meringues being fished out of a tub of liquid nitrogen right at the table. A scoop of grain mustard icecream served up in a tiny bowl of red cabbage gazpacho. There is childlike delight around the table at our medley of savoury lollies. How can an icepop taste exactly like a Waldorf salad? Why didn’t I think of a chicken liver parfait Golden Gaytime myself? The instructions on how to eat the jelly of quail are specific. “In the cup you have a number of different layers, so make sure every spoonful gets a taste of all of them. After each spoonful, take a bite of the toast, so you get the full forest experience.” We don’t have to worry – as we eat, a mixture of oak moss essential oil, alcohol and hot water is poured over a sod of real moss in the centre of the table, coating the whole table with a thick white mist that dissipates as we finish eating. It brings the forest right to our nostrils. The snail porridge is green, but at that point everything else has been so complex or surprising that it is hardly worth mentioning. I take detailed written notes for the next course: a piece of West Australian marron (local crayfish), served with shiitake mushrooms, confit kombu (sea kelp) and sea lettuce. But none of my scribbles do this seemingly simple dish justice in retrospect. The waitress approaches with a cigar-box from which we each choose a gold fob watch. We are instructed to place the fob watch into the hot water in our individual glass teapots, wait a while, then pour the contents into the teacup. We follow her directive without question. 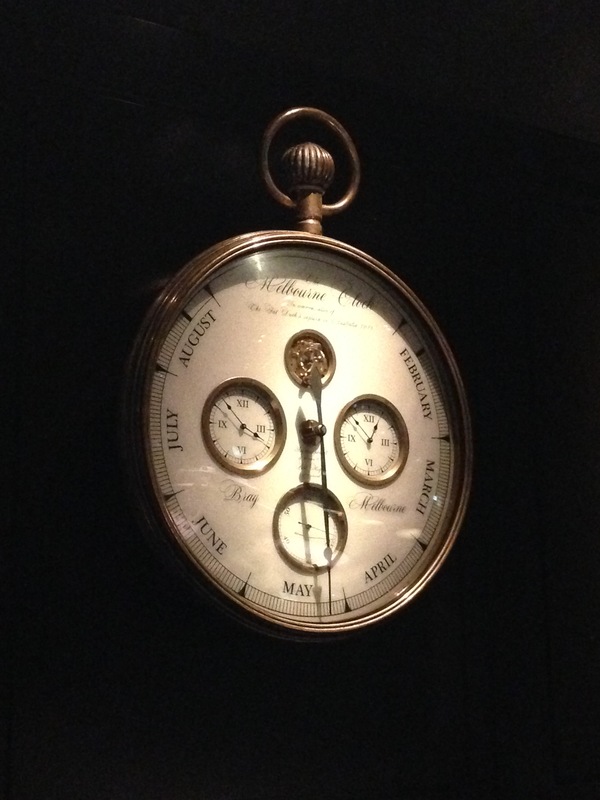 The fob watch starts to dissolve into a heady beef broth, the gold leaf breaking apart. It seems a shame to drown the tiny mushrooms, but it seems we must. Our strange tea is helped down by a handful of miniature sandwiches served on a platter shaped like a tipsy top hat, perfect rectangles of white bread containing long-lost flavours such as anchovies and bone marrow. It is all not so much an eighth course as an elaborate piece of dramatic theatre. So what could possibly follow? A classic Heston dish: Sound of the Sea. A beautiful glass-topped wooden box appears in front of each of us, sand like crushed coral beneath the glass, a perfect representation of the water’s edge arranged on top. Apparently the sand is imported from Venezuela because Australian sand doesn’t look sandy enough for this dish. We reach for our individual conch shells and put the headphones on: waves crash and ebb, transporting us to the seaside. In front of us, edible flotsam and jetsam on a bed of edible sand nestle alongside white foam that tastes exactly like the ocean. Pieces of kingfish, abalone and butterfish sashimi; morsels of seaweed. They said the sand was made with anchovy and tapioca. I thought it tasted exactly like the sand we ate in our sandwiches every summer Sunday in Skerries or Dollymount strand or Brittas Bay. Next comes a piece of salmon, strangely coated with a liquorice gel, served with a sprinkle of grapefruit roe and shaves of endive. “The salmon tastes like madeira cake!”, Eileen says. “What? I don’t get it”, I frown. We approach the eleventh course, and the second bottle of red. Three of four coins of lamb appear on a plain white plate, garnished with dashes and dots like edible morse code. Tiny blocks of cucumber, a sprinkle of caviar, shreds of green leaves. On a side dish sits an off-square glass of lamb broth adorned with tiny flowers, and a small bone-shaped platter with three more morsels of lamb: tongue, crag and heart. All melt-in-your-mouth perfectly cooked. It’s all gone in an instant. I can’t figure out whether it’s one of the more pedestrian dishes, or whether my ability to be blown away is slightly dulled at this late hour. It’s almost midnight. 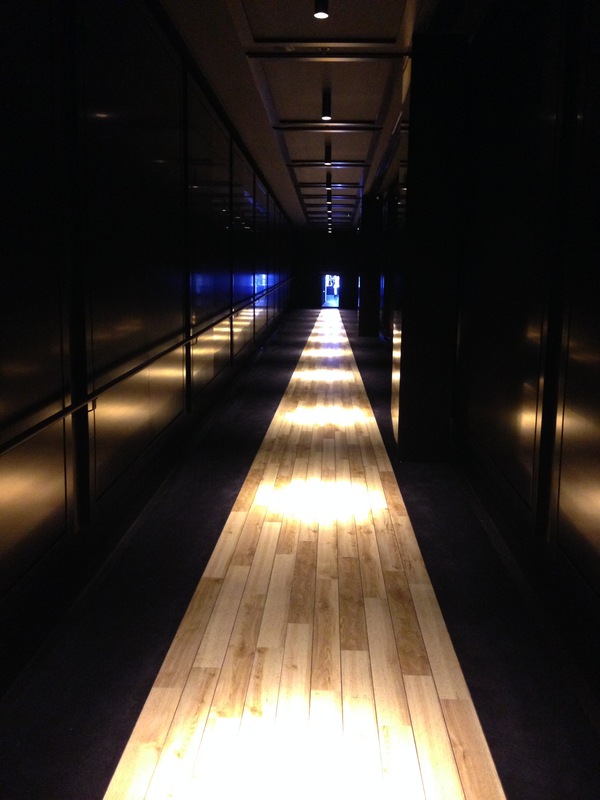 “Would you lke to see the kitchen?” We hop up and follow the server to to Heston’s hallowed ground. Matthew, a nice bloke from Bournemouth, seems to be in charge. He chats to me and Kelvin while the others get to know the French sommelier, who has left his wife and two children in England and lives for his Skype chats. He’s looking forward to seeing them for a holiday soon, and showing the children the kangaroos and koala bears. Nonchalantly, somebody hands us each a cup and saucer. “Cup of tea? It’s Earl Grey.” “Thanks.” I glance before sipping: a simple Earl Grey served black, no milk, no lemon. Then: what the hell? We look wildly at each other, trying to stay cool, and take another sip. Right first time. The tea in the cup is scalding hot on the right hand side, freezing cold on the left. Somebody has made two Earl Grey teas of slightly differing viscosity, one hot and one cold, and poured them into a single cup. 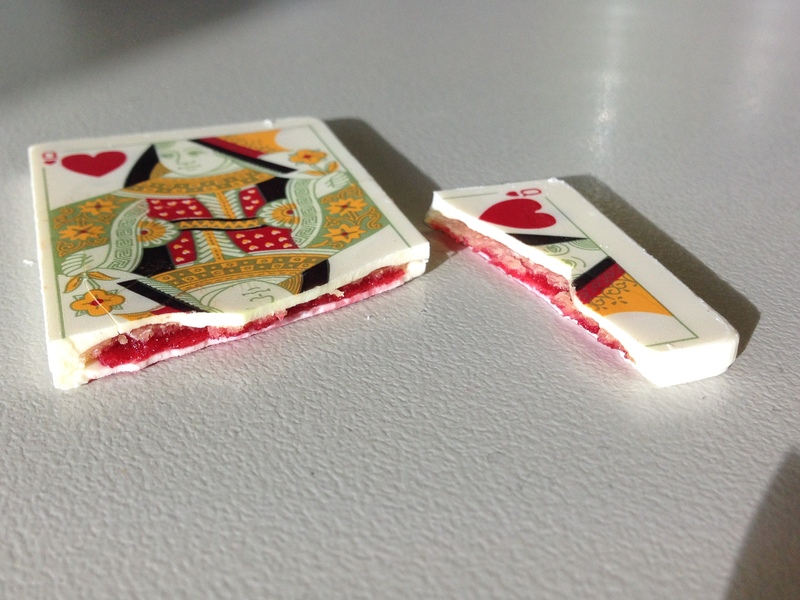 Even a simple cuppa takes on a strange twist here in Wonderland. After our kitchen visit, it appears we have finally reached the dessert courses. A sparkling, glistening display of flavours are arranged on a plain white dish, reminiscent either of a bunch of grapes or a Christmas tree decoration. 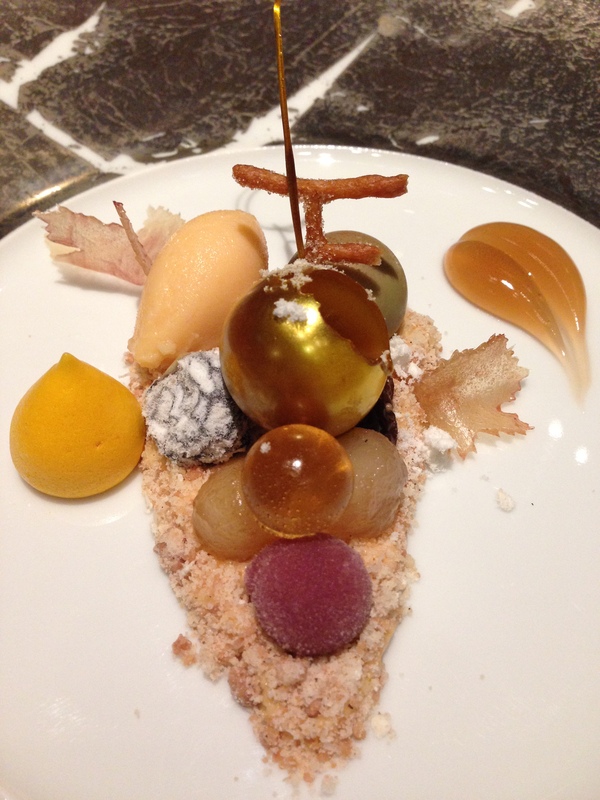 A gold bauble filled with a citrus cream; a dollop of apricot jelly; a sphere of nectarine mousse. A cheeky shrivelled grape coated with the botrytis mould that gives the botrytis riesling its unique flavour. Mind blowing and beautiful. And then, it’s tomorrow. Just after midnight our server-famous-for-the-liquid-nitrogen greets us with a cheerful “Good morning!” A mini cereal box is offered to each of us, like a Kellogg’s Variety Pack option I’ve not seen before. 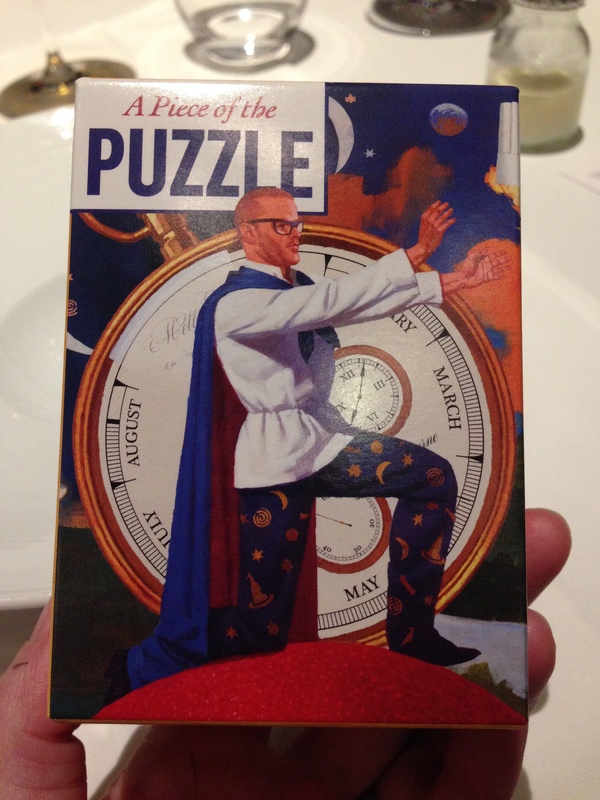 On the box Heston the Wizard is pictured in a cape, kneeling in front of his Fat Duck Melbourne Clock. Into a bowl we pour a handful of what looks like Frosties, and pour some parsnip milk on top. (Yes, parsnip milk). Actually, they sort of taste like Frosties too, but there is also the snap-crackle-pop of popping candy in there too. The parsnip milk tastes exactly like the last, overly sweet spoonful of sugary milk at the bottom of your childhood breakfast bowl. The extra touch is the free toy in each box: a piece of the enormous jigsaw puzzle slowly being assembled on the restaurant wall. Our server helps us find the spot on the section being put together tonight, with the aid of some tiny code numbers on the back. 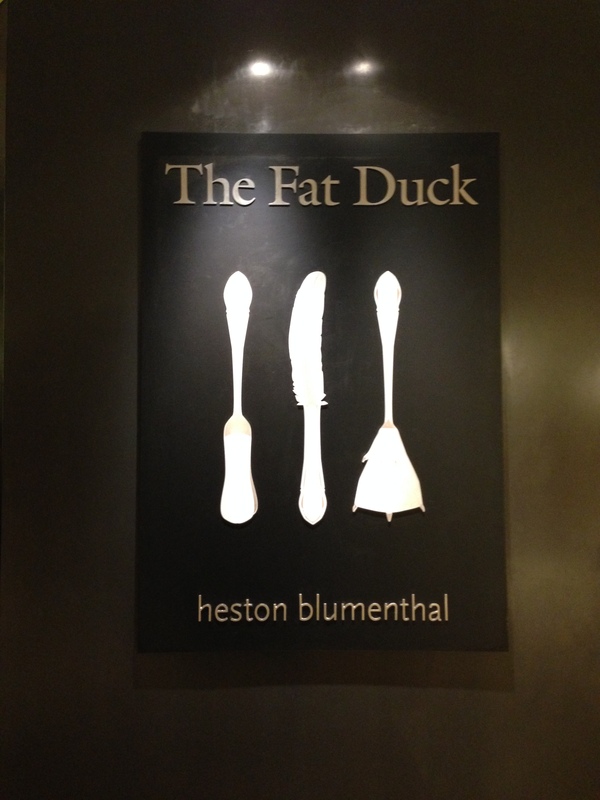 We are now officially part of Heston History. Next, the liquid nitrogen is up again. Our server/illusionist chooses some eggs “laid by the Fat Duck chickens” and appears to break them into the liquid nitrogen to scramble them. I suspect some trickery here, but I don’t question too much and spoil the fun. In time each of us is presented with a platter of nitro-poached egg and bacon icecream, served on a chilled moist brioche bun with a side of crispy bacon and a tiny pot of marmalade with a perfect red and white checkered lid that turned out to be made from white chocolate. To somebody who (a) prefers her food scalding hot and (b) prefers savoury over sweet, this was a hugely conflicting dish which, in the end, I adored. Bravo. It’s almost one in the morning on a schoolnight. We’re exhausted and pretty full. What more could there be? 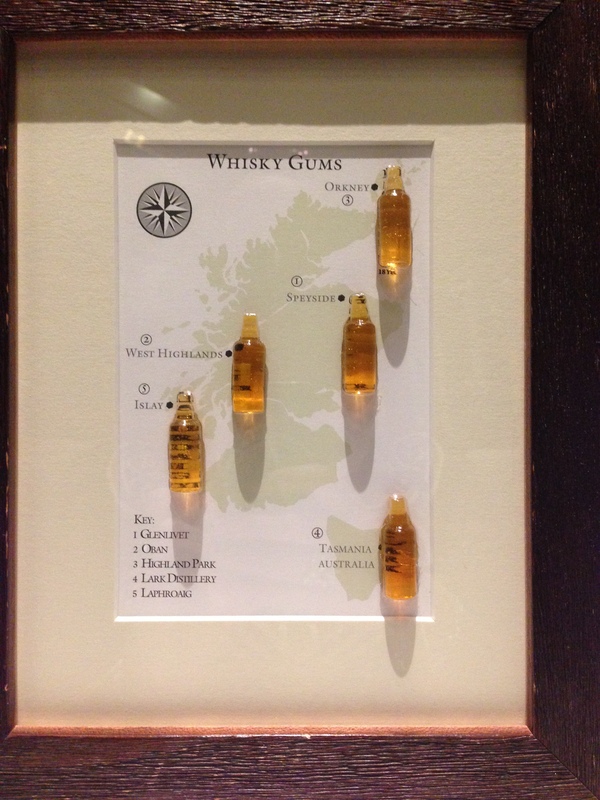 A framed selection of whisky wine gums, that’s what, made from the whiskies of Glenlivet, Oban, Highland Park, Tasmania’s Lark Distillery and Laphroaig. To be consumed in that precise order, if you don’t mind. I don’t like whisky, but I like these. Finally, our tastebuds and our energy levels waning, the final flourish of wizardry. A pink and white striped candy bag appears for each diner, the bag itself infused with the unmistakable smell of an old-fashioned sweetshop. Inside, an aerated chocolate (Aero? 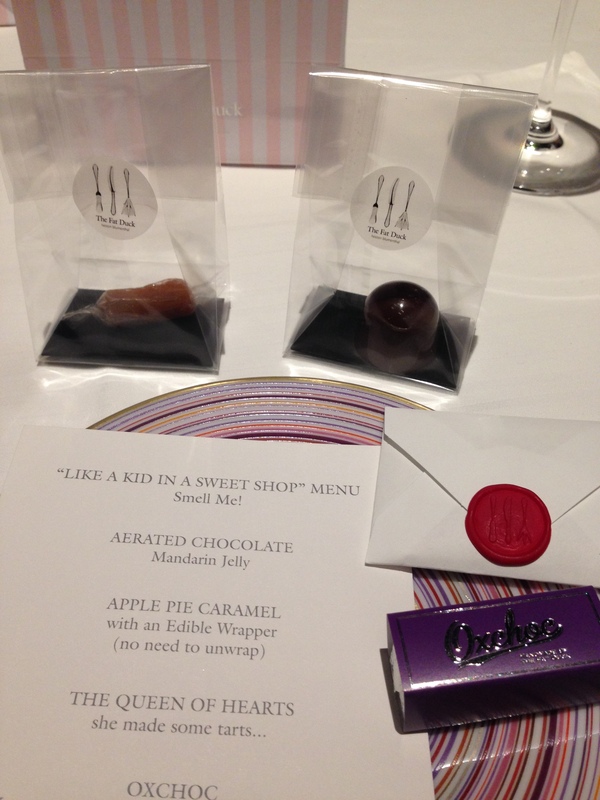 ), an apple pie caramel wrapped in edible cellophane, a “ox-choc” savoury chocolate and Heston’s famous Queen of Hearts snug inside a tiny waxed envelope. I manage three but hold on to the Queen, hoping for a quiet moment later in the week where I can savour her in private. It’s half past one in the morning. We emerge after five hours of illusion, magic, genius, science and, yes, Wonder. 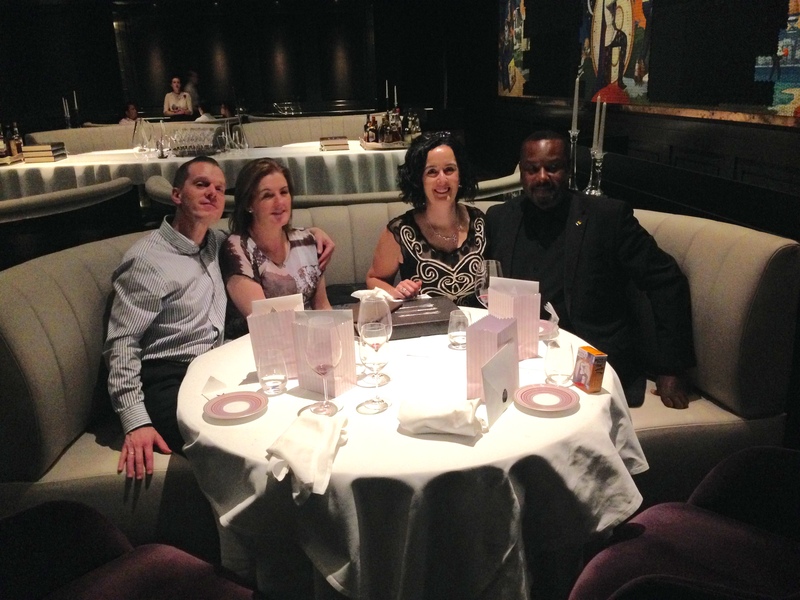 It wasn’t a sixteen-course meal, it was an extravagant piece of theatre that happened to involve food and wine. It wasn’t only worth the money, it was value for money. I feel enormously fortunate to have been able to experience this amazing event here in Melbourne, and I can’t wait for Dinner by Heston to open when The Fat Duck moves home to Bray.